On its own, popcorn is rarely my snack of choice. Sometimes I’ll pop some and add some parmesan and herbs if I’m with other popcorn lovers, but I’ve never gotten any at the movies (have you seen that “butter” they pour on it), and I much prefer the salty crunch of pretzels. 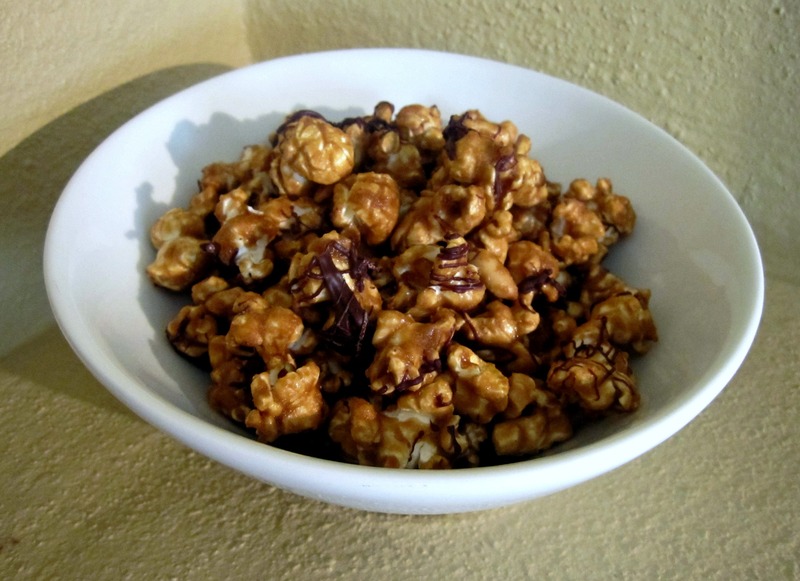 This recipe for Caramel Corn with Peanuts and Chocolate from Matt Lewis and Renato Proliafito’s book Baked Explorations will satisfy the sweet and salty tooth of ambivalent popcorn eaters like Matt or of the most passionate popcorn partisans. You’ve probably noticed that I’ve used recipes from Baked a lot lately. I’m making up for severely under-using the two bakery books since I bought them. While I do think the recipes are less precise than other baking guides that I love, the tasty, almost playful recipes are all drool-worthy and, with a little baking know-how, can be easily executed. For me, caramel corn has to have peanuts. Check. Salty peanuts. Check. It has to be completely coated in caramel with minimal bald spots. Check. The caramel has to have a deep flavor; it can’t just taste sweet. Check. And it has to have something to give it some pizzaz. Check. This recipe fits all of my criteria, because it uses salted peanuts (I upped the amount), includes dark brown sugar and molasses for a deep, almost smoky flavor, and calls for drizzles of dark and milk chocolate (I just used semi-sweet). I never break mine up completely into individual kernels. I like the surprise of picking out a big cluster of popcorn and peanuts during a mindless munch session. Caramel corn making will now be a new seasonal tradition for me. I can’t wait to try variations in the future. I’m already dreaming up popcorn with peanut butter caramel, white chocolate drizzle, and pretzel pieces. This could be dangerous. I found the original recipe in Baked Explorations, by Matt Lewis and Renato Proliafito, but my adapted version is below. If you are starting with kernels, pop them using any method you prefer and let them cool. Preheat the oven to 250 degrees. Place the popcorn in a large roasting pan. Line a sheet pan with parchment paper. In a medium saucepan over low heat, start to melt the butter. Add the brown sugar, corn syrup, and molasses, and stir gently with a heatproof spatula. Continue to cook over medium heat, stirring only occasionally, until the mixture starts to boil. Clip a candy thermometer to the side of the pan and bring the syrup to the soft-ball stage, approximately 240 degrees. Remove the pan from the heat and stir in the salt, the baking soda, and vanilla (don’t be alarmed, it will bubble and change color). Pour the caramel over the popcorn in large streams, then sprinkle with the peanuts. 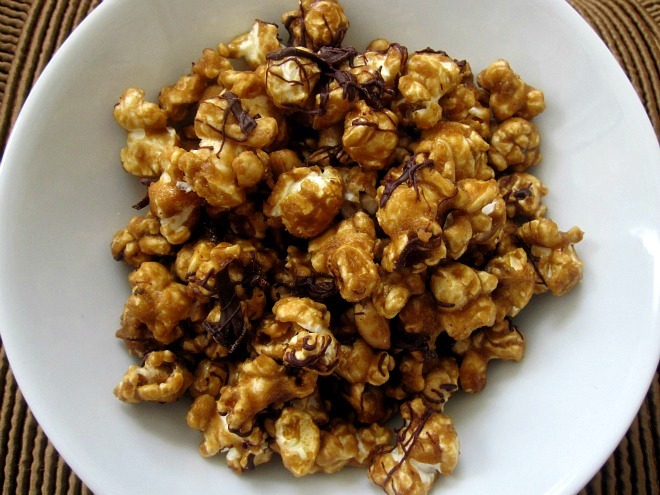 Use two spatulas to fold the popcorn until it is completely coated with caramel. Place the roasting pan in the oven and bake for 15 minutes. 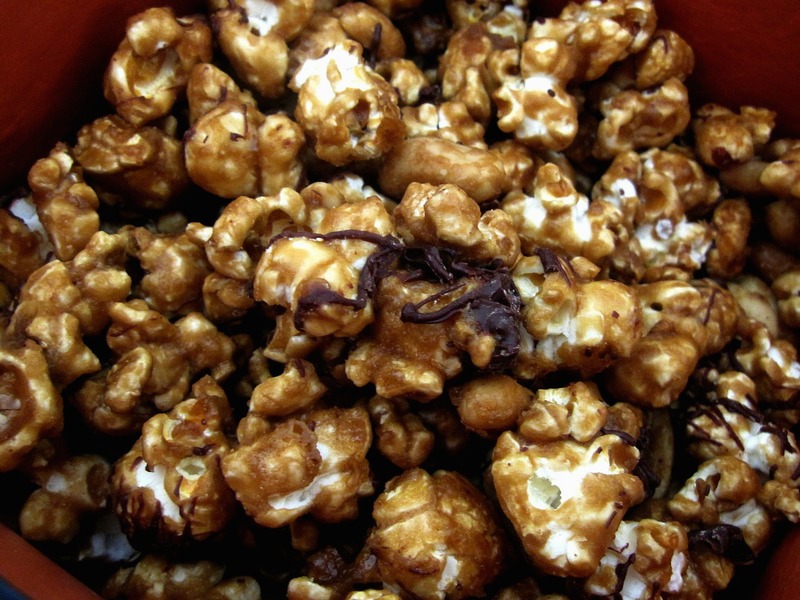 Use spatula to lift, flip, and coat the popcorn in the warm caramel, then continue baking for another 20 minutes. Cool the caramel popcorn in the pan for 5 minutes and transfer it to the lined sheet pan. Cool for approximately 15 minutes and drizzle the chocolate in crisscross patterns over the top with a fork. Let the chocolate set before breaking the popcorn into serving-size pieces. Store in an airtight container for up to 1 week. *The chocolate must be tempered, or it will not set properly leaving for fudgy rather than snappy streaks and a lack of shine. There are very helpful instructions in the book for tempering chocolate. If you don’t own the book, there is a great tutorial on tempering chocolate by Liz Gutman (of my favorite candy company, Liddabit Sweets) on Serious Eats. I’m somewhat embarrassed to admit that I love that disgusting movie theater popcorn. It’s just one of those things. Luckily, we don’t go to the movies too often. This looks amazing, though, and I bet I’ll be making it for some upcoming holiday parties. Yum! I’ve been turning to the Baked cookbooks a lot lately too. This popcorn keeps catching my eye. And I too love fall and think it keeps getting shorter and shorter. I really want to live somewhere where it’s always fall with a little summer thrown in.